I blame the heat - 32 degrees - for my failure to take note (or even notes) of what I was seeing at Kelmscott Manor last weekend. It was so sapping that I wilted, wandered round in a dwalm, and didn't think to ask the guide about this design sketch in William Morris's bedroom, so I can't tell you whose hand is behind it or what, if anything, it eventually became. I must go back on a cooler day. Whatever the weather, though, I recommend The Bell Inn at nearby Langford for lunch. 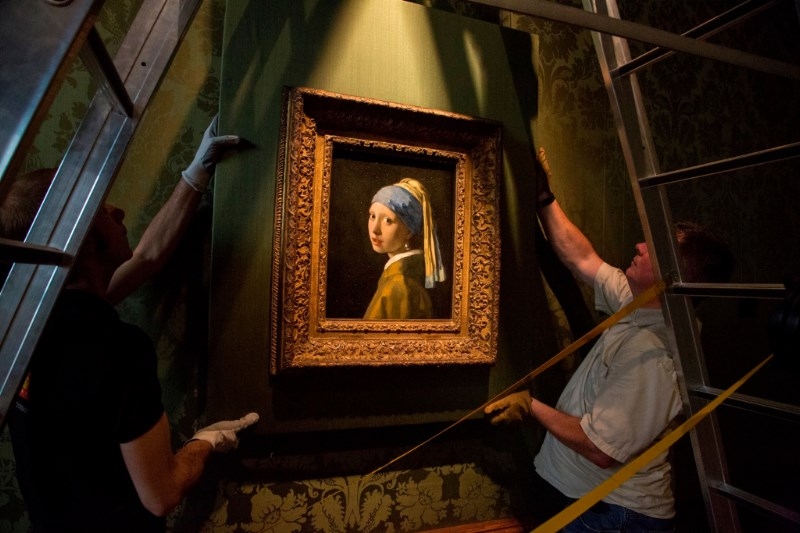 If you saw this post from last year about the (Colin Firth-less) Girl with a Pearl Earring and Other Treasures of the Mauritshuis, you may be interested to know that the film is to be shown on ITV tonight at 11.10 as part of the Great Art series. BBC news reminds us that today is the hundredth anniversary of the death of Dr. Elsie Inglis. The bust is by the Croatian sculptor Ivan Mestrovic and is in Edinburgh's National Portrait Gallery. At the National Gallery of Scotland on Friday I went to a talk by Dr. Andrew Paterson, "Two Flower Paintings of the 18th. Century", looking at Flower Still Life with Bird's Nest, c.1718 by Jan van Huysum, and A Vase of Flowers, early 1760s, by Jean-Baptiste Siméon Chardin. The juxtaposition was illuminating, showing two alternative conceptions of what the medium can achieve, the first picture being "a tour de force of theatrical illusion, almost microscopic in its detail", the second being much more "painterly" and natural. I've tried to capture the main points here. The van Huysum, above, includes 20 different species of flower and would have been impossible to create in real life - given the flowers' blooming seasons - so the artist would have either relied on his own image bank of studies, or assembled the picture in a piecemeal manner over the course of a year. In addition to the flowers there are flies, ants, butterflies (including a Grizzled Skipper), while the nest is that of a mistle thrush. Luminous colours rely on layers of translucent glazes, and the copper on which they are painted allows for great fluidity and precision. In terms of meaning, flowers are the prime signifiers of the transience of earthly beauty, while the insects and eggs suggest decay, death, and also renewal of life. The picture is marked by the skill of its composition, the control of chromatic relationships, and by its tonal balance. The Chardin, in contrast, is a very simple composition, "virtually artless". A Delft vase contains carnations, tuberoses, and sweet peas (it is thought), all realised in an almost impressionistic manner with the feel of an oil sketch. Known for the quality of his observation and the freshness of his vision, Chardin's brushmarks are here unblended creating a painterly texture, while empty space plays an important compositional role and creates a harmonious atmosphere. Only five pigments were used, the background likely being a mixture of all of them, and although limited, "the subtleties of the tonal range are the equal of van Huysum's". Chardin was "alchemical" in his handling of oil paint, apparently, and did not share his secrets with anyone. While the earlier picture is the apogee of a tradition*, the later one is very forward-looking and modern, showing an individual sensibility and that there is more to painting than a mastery of technique. As Chardin said, "One uses colours but one paints with feeling." If you have a spare 20 minutes, do watch this. Nicholas Hely Hutchinson's website is here, and the Portland Gallery's exhibition page here. So sorry to hear today of the death of Jill Barklem, creator of the much-loved Brambly Hedge books. This is The Angler (c.1912) by William Orpen. Tate Britain has it, allegedly, but along with almost all the Sargents I went to see there on Sunday, it's frustratingly 'not on display'. I wish I had the keys to the cupboard they keep them in. This year's Art Workers' Guild auction is open for bidding - all details and lots here. The above is an illustration by Angela Barrett for Eleanor Farjeon's story Young Kate. My favourite of the many family portraits on display at Dunrobin was this one by Philip de László* of the 5th. Duchess of Sutherland.